I recently had an opportunity to quiz author Jess Waid on his latest work, Kona Gold, sixth volume in his Mike Montego series. MORSE: Kona Gold marks the first time in a series that now spans six books that you’ve taken your main character, LAPD cop Mike Montego, out of California (and Vegas). Why Hawaii? WAID: Mike has a lot of my characteristics, and likewise “relives” some of my past. I had occasion to be in Hawaii in the early Sixties and still have vivid memories of my time there. Several of my experiences on Oahu were fairly close to what Mike experiences in Kona Gold. The one difference — I was between marriages. I’ve visited Hawaii several times since then, and it has changed greatly, as have Los Angeles and Vegas. MORSE: How long had the plot for KG been percolating in your head before you began writing? Or are you an author who simply sits down at your computer and lets the creative juices flow? WAID: There was very little “percolating” for Kona Gold. But having written stories that took place in Las Vegas and also northern Idaho, I saw another of my “past lives,” this time in Hawaii, fitting rather neatly into a new story. Also, recently divorced back then, I saw a parallel with Mike’s situation. MORSE: What’s your writing routine? Are you disciplined, writing for a set period every day? Or do you write in feverish spurts? Is writing work or play? WAID: When I’m into a story, I pound on the keys for hours regardless of the time of day, seven days a week. I find it to be enjoyable as I often am reliving past experiences, only modifying them to make for a more enjoyable read. MORSE: Why is it that so many former cops end up writing books? Have you ever chatted with former colleagues about that? WAID: I’ve been writing since ’92, ten years after having spent 22 years with the LAPD. My writing started when I sought an outlet to express myself; sort of like needing to justify my life. I was living in northern Idaho, in an area enjoyed by a number of retired LAPD types. Several were employed, most not. I worked with the Bonner County Sheriff’s Department for one year, thanks to a federal grant written by my wife, Barbara. The subject matter was domestic violence. That experience, incidentally, partly triggered my later novel Circle of Yellow. That’s why part of that story originated in the Idaho/Montana area. Back to your question. I recognize that many retired law enforcement officers have experienced events that the “average Joe” has only dreamed about. Officers with a proclivity toward writing will put their experiences to print for personal reasons, as I’ve mentioned, often to relive their past. For me, it’s like getting a shot of adrenaline. I’ve often found my heart rate speeding during the course of writing a scene, usually a tense one, to the point I have to take a break after the scene is written to calm myself! MORSE: Music often pops up in your books. Of course that was front and center in He Blew Blue Jazz. Hawaii has an amazingly rich musical tradition — any of that showing up in KG? And BTW, I understand you’re off for Vegas soon for some sort of reunion, and that your old pal, Art Imbach, will be there. Is Art still making the musical magic happen? MORSE: Finally, the inevitable question: what’s next? Another Montego? Or are you finally going to tackle that Mexican historical epic you’ve been scratching at the edges of for years now? WAID: Ah yes. Barbara rides me about writing the “great epic” taking place south of the border, the land of my natural father. However, the germ of one more novel is gestating in my mind. It, too, will take place in Hawaii. Kona Gold left Mike sort of hanging, with some drug and human trafficking issues unanswered. Besides, there are still some “bad guys” running around the islands. I only have a working title so far: Kona Black. 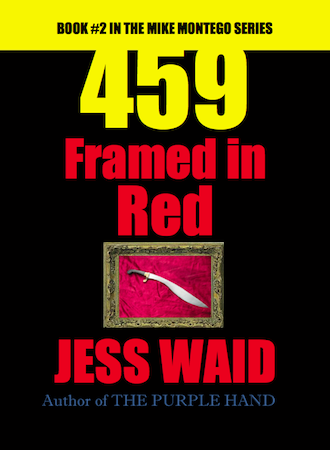 For more on Jess Waid and his books, visit his website, at www.jesswaid.com. In the old days, there were only a handful of authors able to count on a campaign to bring their works to the attention of potential readers. They were, of course, the “big names,” whose books were published by the major houses. My, how times have changed! Digital technologies have made it possible for enterprising writers to reach out to audiences in new, compelling — and cost-effective — ways. Here’s a snappy new promotion for Jess Waid‘s Mike Montego series, directed & produced by German music video director, Loic Rathscheck. Take that, Norman and Ian! The Mike Montego Series Grows! I’m pleased to announced the Mike Montego series is about to expand to a half dozen titles. Book Six, KONA GOLD, is nearly ready to go. If you have a soft spot for the Sixties, island culture, and fast-paced detective fiction, then I suspect you’re going to like KONA GOLD. (Click here for more info). Let me know if you’d like to know more about this new title, or any of the other Montego novels.